I met Fred Phelps in 1990 in the small Citizen-Patriot office in tiny Atwood, Kan., as the man best known for being a hate enthusiast was making his first bid for the Kansas governor’s office against the incumbent, Mike Hayden, who grew up in Atwood. Besides Atwood Buffalo sports, it was the northwest Kansas community’s claim to fame, and I was in my rookie year of being a professional journalist. What I learned the day was that Phelps was a very intelligent, yet misguided soul who actually thought he had a chance to be the state’s chief executive. As most Christians reveal in their faith, God doesn’t hate, so Westboro Baptist’s primary cause drew the ire of millions. Members picketed the funerals of soldiers who had given their lives for our country; they picketed the funerals of children. 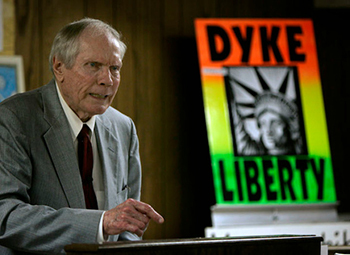 There will be no funeral for Fred Phelps, and no reason has been given. There are many who call for a crusade against Phelps and his posse, a display that would lash back at Westboro Baptist’s decades-old tactic of free expression. The problem with that method would be sinking to the church’s message of hate. My wish would be that we pepper the congregation with something they haven’t seen in years: We share God’s love in their time of grief and offer them condolences and true prayers. That’s what the Phelps family and the members of the Westboro Baptist Church need most. It might just aggravate the tar out of them, but it’s the right thing to do.